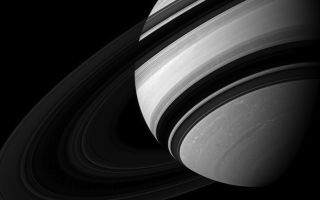 Saturn's moon Mimas appears near Saturn, dwarfed by its parent planet in this image. Saturn's moon Mimas appears near Saturn, dwarfed by its parent planet in this space wallpaper. Mimas (246 miles, or 396 kilometers across) appears tiny compared to the storms clearly visible in far northern and southern hemispheres of Saturn. This view looks toward the unilluminated side of the rings from about 18 degrees below the ringplane. North on Saturn is up and rotated 27 degrees to the left.